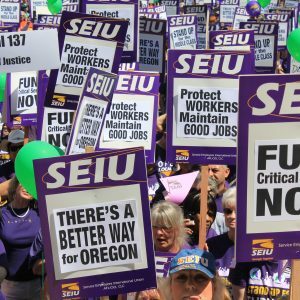 In August 2015 amidst a sea of self-created hoopla, the Freedom Foundation announced they were crossing the Columbia from Washington to begin their effort to undermine working families in Oregon. They held a balloon-ridden press conference and declared, “…Remember today, because today marks the beginning of the end of [SEIU 503’s] reign at the top of the political heap.” [Statesman Journal 8/14/15] It was supposed to worry us. It was meant to intimidate us. It did none of those things. They opened an office in Salem, hired lawyers and spent big money requesting our personal information. They filed a lawsuit that they thought would upend our union. It didn’t. It failed. Other lawsuits were filed, they spent their out-of-state money to hire canvassers to knock on our doors, and they even chartered an airplane that dragged a sign behind it to fly over Salem and criticize our leadership. They tried to frame themselves as a new type of organization focused on “Free Speech Rights.” But we knew the entire time they were just another run-of-the-mill anti-worker organization with deep pockets. Since they have been in Oregon, they have talked a big game but their influence has been negligible. Not only have we rejected them but we have actually become stronger: our political power has grown, our membership is at an all-time high, and our political fund contributions are also at record highs. They have failed, and they spent big money doing it. We estimate they have spent just over $5.5 million. Throughout this time they have also cost the taxpayers hundreds of thousands of dollars with their lawsuits and attempts to get our personal information. 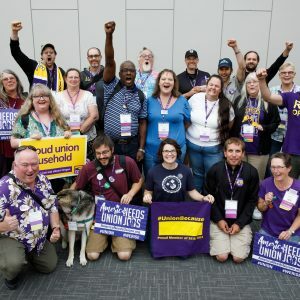 Freedom Foundation Goal #1: Cut union membership by getting state and local governments to give over our personal information so they can come to our houses and try to convince us to opt out of our union. 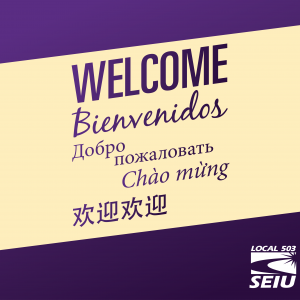 Outcome: SEIU 503 has more members now than ever before in our history, because 503 members know that when we stick together we can fight for an increase in wages, better healthcare and paid sick leave. Freedom Foundation Goal #2: Destroy our political power. Outcome: Members are contributing to CAPE in record numbers, thanks to the Freedom Foundation. Freedom Foundation Goal #3: Weaken the progressive community in Oregon and the voice of working families at the Capitol. Outcome: In the past year, working families, faith leaders and community organizations have joined together and won a landmark minimum wage increase and paid sick leave. The Freedom Foundation is actively against working families on both of these issues. Freedom Foundation Goal #4: Destroy collective bargaining through a legal framework to take away working families’ voices in the workplace. Outcome: They have filed frivolous lawsuits, including the “benchmark” lawsuit they filed upon their arrival into Oregon, Brown v. Brown. It sought to erode the voice of home care and child care workers. They lost this case. One shudders to think about the amount of money they spent trying to win. Freedom Foundation Goal #5: Establish Freedom Foundation as a leading voice for Freedom in Oregon. Outcome: They have shown they are just a typical State Policy Network (the Koch brother’s network) organization that hires typical right-wing operatives who have spoken out against LGBT rights and marriage equality, women’s health, workers’ rights, immigrant rights and have even denied that climate change is happening. The Freedom Foundation embodies everything that’s wrong with the anti-worker movement and we are fired up, fighting back and winning.